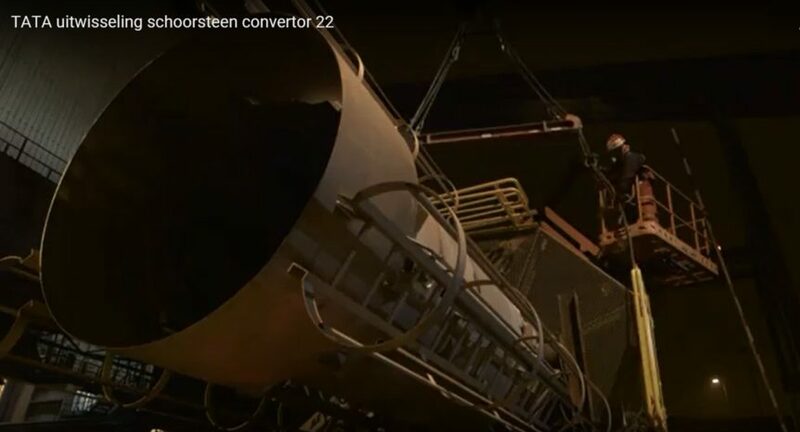 Mercon has successfully completed the chimney project at Tata Steel in IJmuiden. The chimneys of converters 21 and 22 have been replaced. The new chimneys have been prefabricated and then transported to Tata. The chimney of converter 22 was first replaced and the chimney of converter 21 subsequently. The torch tops of the chimneys were removed followed by the rest of the chimneys. The lifting and placement of the new chimneys has been successfully been carried out. In attached movie (courtesy of Tata) the exchange operation of the chimney for converter 22 can be seen.